LOS ALAMOS, N.M., June 10, 2004 -- University of California scientists working at Los Alamos National Laboratory with a colleague from Sandia National Laboratories have developed a new method for exciting light emission from nanocrystal quantum dots. 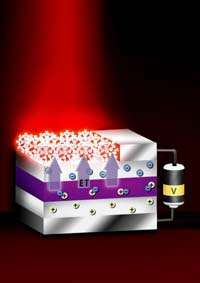 The discovery provides a way to supply energy to quantum dots without wires, and paves the way for a potentially wider use of tunable nanocrystalline materials in a variety of novel light-emitting technologies ranging from electronic displays to solid-state lighting and electrically pumped nanoscale lasers. In a paper published in the today's issue of the scientific journal Nature, Los Alamos Chemistry Division scientist Victor Klimov and his colleagues describe their method for using non-contact, non-radiative energy transfer from a quantum well to produce light from an adjacent layer of nanocrystals. A quantum well is a semiconductor structure in which an electron is sandwiched between two barriers so that its motion is confined to two dimensions. In a real-life device, the quantum well would be pumped electrically in the same way a common quantum-well light-emitting diode is pumped. According to Klimov, "The transfer of energy is fast enough to compete with exciton recombination in the quantum well, and that allows us to "move" more than 50 percent of the excitons to adjacent quantum dots. The recombination of these transferred excitons leads to emission of light with color that can be controlled by quantum dot size. The high efficiency of energy transfer in combination with the exceptional luminescent properties of nanocrystal quantum dots make hybrid quantum-well/nanocrystal devices feasible as efficient sources of any color light -- or even white light." In addition to Klimov, project scientists include Marc Achermann, Melissa Petruska, Simon Kos and Darryl Smith from Los Alamos, along with Daniel Koleske from Sandia National Laboratories. Quantum dot research at Los Alamos has led to a number of innovations over the past several years, including news ways to observe and manipulate nanodots and methods for making semiconductor nanocrystals respond to photons by producing multiple electrons as a result of impact ionization (www.lanl.gov/orgs/pa/newsbulle … 4/05/03/text02.shtml). That innovation has potential applications in a new generation of solar cells that would produce as much as 35 percent more electrical output than current solar cells. The nanocrystal quantum dot research is funded by DOE's Office of Basics Energy Sciences and by the Los Alamos Laboratory-Directed Research and Development (LDRD) program. LDRD funds basic and applied research and development focusing on employee-initiated creative proposals selected at the discretion of the Laboratory director. Additional information on Los Alamos quantum dot research is available at quantumdot.lanl.gov/ online. Los Alamos enhances global security by ensuring the safety and reliability of the U.S. nuclear deterrent, developing technologies to reduce threats from weapons of mass destruction, and solving problems related to defense, energy, environment, infrastructure, health and national security concerns. The original news release is available here.